The Travelling Lindfields: Chiloé - Land of Witches, Mermaids and Ghosts. Chiloé - Land of Witches, Mermaids and Ghosts. The volcano Osorno rises above the clouds; snow-capped, serene, quiet for now. It is March and we are on our way to Chiloé, an archipelago off the west coast of Chile in Northern Patagonia. Tomorrow we drive to Puerto Montt and take the ferry to La Isla Grande de Chiloé, but today we are treating ourselves to a touch of modern Chilean luxury before plunging into the labyrinth of myths and magic that is Chiloé. We are staying at the Casa Molino, a small hotel on the shores of Lake Llanquihue. It was ridiculously hard to find and the last five kilometres or so of the dirt access road had so many potholes we wondered more than once whether we would make it. This is not a place to arrive at after dark - but our efforts have been rewarded. The hotel is lovely and has an uninterrupted view across the lake to Osorno. The spectacle is breathtaking. It is possible to fly to Chiloé, the island's first airport opened in November 2012 - but why would you? The ferry trip across the Chacao Strait is half the fun. About an hour and a half by car south of the Casa Molino we arrive at the end of the mainland; literally and abruptly. No town, no petrol station, no anything - just a wharf and a queue of trucks and buses. This is our second attempt at visiting Chiloé. In November 2010 we arrived at this same point ready to board the ferry, only to chicken out and turn back - defeated. The guide books will tell you that rain and storms are part of Chiloés charm but in 2010 the storm was more like a force 10 gale. The intensity of the wind and rain increased exponentially with every kilometre we got closer to the wharf. 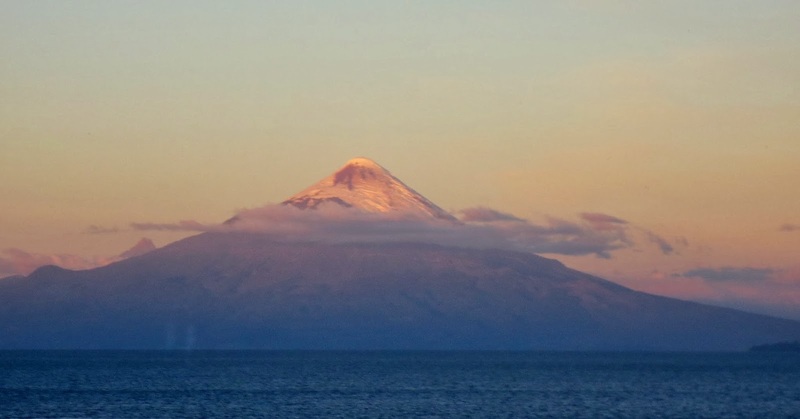 We had spent four days in Puerta Varas on the shores of Lake LLanquihue and didn't once even so much as glimpse the magnificent Osorno through the clouds. When we arrived at the wharf we just couldn't see the point. We had set aside only a few hours for the island, we were running low on petrol, we weren't sure where we would find the next petrol station and we had no real idea of how regular the ferry service was. This time we are prepared. David has done his homework on the climate, I have done mine on the ferry service, we have a full tank of petrol and four days to explore the island. We pull out past the trucks and buses into the car queue and are soon standing on the upper deck of the ferry watching seals playing in the wake. Civilisation, such as it is in this part of the world, recedes into the distance. For most of its history Chiloés inhabitants have been isolated from mainland Patagonia. This is a place where the people believe in magic. There seems little doubt that witches roam the island by night, mermaids swim in the bays and the ghost ship 'Caleuche', crewed by the living-dead, sails the seas. The ferry disgorges it's cargo in a spot almost as remote as it's mainland departure point. A single paved highway leads south to the towns of Ancud, Castro and Quellón. We choose the coastal route - a slow, tortuous, isolated, undulating dirt road, dotted infrequently with specs of civilisation. The countryside is wonderfully bucolic. The tiny villages and farms appear almost untouched by the modern world. Best of all are the churches. Chiloé is famous for its churches. 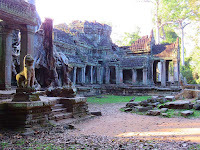 Many are protected as world heritage sites. Wooden structures, painted in bright spring colours many stand alone in the fields. We hunt them down and tick them off. My favourite is the lolly-yellow and purple church in Castro. A church standing alone in a field. We stay in a Palafito hotel in Castro. It is small and quirky with random hot water but the ambiance is stunning. The Palafitos of Castro are stilt houses built jutting out over the water into the bay. They give easy access to the sea on one side and to the land on the other. Our room at the top has a view of the bay. This is not a place to save money by choosing the room with no view. Each morning we open the curtains to the timeless serenity of the local fishermen setting out in their boats. In the evenings we watch the tide recede and the mud flats and sea grasses re-appear. Our 'street' at low tide. As well as the main island, La Isla Grande de Chiloé (roughly translated as the Big Island of Chiloé), there are several smaller islands nestled in the eastern inlets and bays. The best of these is Quinchao. It's only access is by ferry. On a whim we join the small procession of cars embarking on the short journey to the island. Remote even by the standards of this part of Patagonia, Quinchao stands apart from the modern world in its own small envelope of timelessness. The sealed road soon exhausts itself. The island is long and narrow and we bump along the dirt to it's southernmost tip at Chequian exploring dead-ends and side roads as they wind around the bays and harbours. Santa Maria de Loreto at Achao, Quinchao. We avoid Ancud until our final day. It is the largest Chiloén town and the guide books don't recommend it. Luckily we have a few hours to spare because the guide books have misled us. The seaside is littered with the paraphernalia of an unhurried village fishing industry. Colourful boats lay settled in the low-tide mudflats, old men sit and look out to sea, younger men work repairing boats and casting nets. We abandon the car and stroll along the wharves filling ourselves with as much of the atmosphere of the island as we can. Today we must take the ferry back to the mainland. Chiloé is an archipelago consisting of La Isla Grande de Chiloé, about 190 km long by 60 km wide and several much smaller islands nestled in the inlets, bays and harbours of the main island. It sits to the west of Chile about half way down the coast. When to go: Forget all the guide-book rubbish about rain and mist being part of Chiloés charm. You can't appreciate a place unless you can see it. Go in February or March. By Bus: Long distance buses run between Chiloé and a number of towns on the mainland. The 'Welcome to Chile.com' website lists the names and phone numbers of most of the bus companies. Tours: You can take day tours of Chiloé from Puerto Montt but I wouldn't recommend it. Chiloé is far too interesting to see in a single day. There is no petrol station at Pargua. We learnt this the hard way. If you are driving from Puerto Varras there are not a lot of petrol stations on the road. Do yourself a favour and fill up before you leave. Once you arrive on Chiloé the nearest petrol is at Ancud. If you intend to stay on the mainland for a while before departing for Chiloé I would recommend staying at Puerto Varras, rather than Puerto Montt. Puerto Montt is about half an hour closer to the ferry departure point at Pargua but it has none of the charm of Puerto Varras. Driving in Chile: Chile is not nearly as difficult to drive in as you might imagine. Chiloé itself is very easy. Castro and Ancud both have busy centres but the traffic is probably no worse than Parramatta Rd, Sydney on a Saturday morning. Provided you don't mind dirt roads the rest of Chiloé is simple. If you fly into Santiago, you can rent a car there and follow the Panamerican Highway all the way to the southern tip of Chiloé, but don't just stick to the highway. If you do you will miss all the charm. If you hire a car in Argentina make sure you check that you will be allowed to take the car into Chile. Some rental companies won't let you drive across the border. Even then you will need a special permit which the car hire people need a couple of days to arrange. Language: You can get by with English but I found it useful and polite to learn a bit of basic spanish before we went. Particularly if you plan to drive it is comforting to be able to read the road signs. Note on my recommendations: While I would love to take sponsored trips or get paid for travel writing that is not likely to happen anytime in the forseeable future. This blog is a hobby - nothing more. I have recommended The Casa Molino because it was just lovely. The Palafito 1326 was a bit quirky but it was a lot of fun staying in a Palafito. Be careful when you book though because there appear to be two places with the name Palafito 1326. We stayed in the Apartment Hotel. The other was a B&B. I know that tripadvisor has had a lot of bad press lately but we have found it invaluable in planning our Sth American holidays. You are the very first person ever to comment on my blogger page. Thanks. I do get a few comments via my twitter circle. I can highly recommend Chiloé. It's one of those places few Australians have even heard of (I knew of it through a Chilean friend) and when the weather is good it is such a great place to see. No. Puerto Montt is not pretty at all. Nearby Puerta Varas is very nice though, because it is on the Lake. If you have a car you could stay in Puerta Varas and fly out from Puerto Montt. There is a very good road between the two towns. We first went in November and got great weather in Bariloche and terrible weather in Puerta Varas which was typical for both places at that time of year. Are you doing the lakes crossing? We drove across into Chile via the 'Seven Lakes' drive and San Martin de los Andes. This is one of the most scenic drives we have ever done. I assume you are not driving. If you have the courage to drive I would definitely hire a car while you are in Bariloche and stay out of the centre a bit. The pretty places are all along the lake front and there are some lovely drives. The town of Bariloche itself is overrated but the surrounding countryside is very scenic. I have been intending to do a blog post on Bariloche for a while. I will let you know when I finally get around to it. In the meantime if you have any other questions please feel free to ask. do seem to be some idyllic places to stay. exploration. Apparently the view that way is pretty stupendous too. we have enough time to visit Puerto Varas too. The volcano looks rather nice! We had a friend who did the Lakes Crossing. He said it was exhausting. The reviews you read sound fairly accurate after talking to him. We had lunch at the Llao Llao the first time we were in Bariloche. It has a magnificent setting. We didn't see the rooms - needless to say it is very expensive. The Circuit Chico drive which leads to it is well worth doing. David says you should look at Sixt car rental for your car. We rented through Alamo and then National when we were in Bariloche and both cars were really awful. This time we have a Sixt, rented in Cordoba, and we are very happy with it. Osorno is magnificent but you may be in Patagonia at the wrong time of year. When we were there in March we didn't once see Osorno through the clouds. In November we had magnificent views. As you will have seen from my post, we thought Chiloe was great but you need to have a few days to appreciate it and it's hard to appreciate anything in bad weather. I get the impression you have been to Argentina before. Thanks for the comment Fairlie. That's part of the magic of Chiloe - the churches are real and I haven't enhanced any of the photos. They were taken with a little point and shoot camera. What an amazing trip! Your photos are gorgeous and your descriptions were so lovely that I almost felt as if I was discovering the islands alongside you. I'm glad the weather was more clement this time around, there's nothing worse than taking a ferry on a stormy day! Hi Pearl. Thank you for the kind comments - sorry it has taken me so long to reply. Hi Clem and Marcella. Be careful what time of year you go. We got lovely weather in March but when we first tried to go the previous November the weather was awful. Pick your time of year.